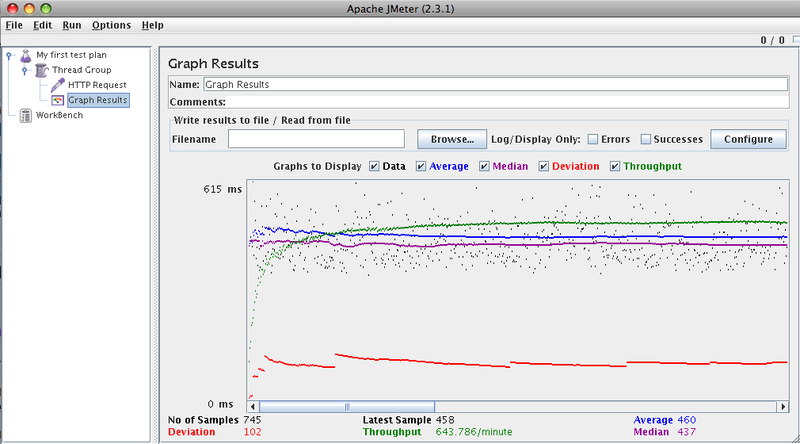 Apache JMeter is a 100% pure Java desktop application designed to load test functional behavior and measure performance. It was originally designed for testing Web Applications but has since expanded to other test functions. You can get the binary here. Go to the bin directory. Run jmeter.sh (jmeter.bat if using Windows) from the command line. Just give a name and any description you want for your test plan. A thread group allows you to specify the amount of load you want to simulate. Select your test plan from the left Tree view, right-click, and select Add -> Thread Group. Ramp up period – the amount of time in seconds to take to reach the number of threads specified. If you choose 0, all of the threads will be created at the start of the test. Loop count – you can specify to loop indefinitely or provide a number of times to run through the test. A sampler is a type of request you want to make. In this example, I used an HTTP request to test load to a web server. It’s good to note JMeter supports multiple types of samplers including web services, JMS, and JDBC. Add a sampler by selecting the Thread Group you just created, right-click, select Add -> Sampler -> HTTP Request. A listener allows you to collect data points and display them in some fashion like a graph or a table. I used the Graph Results listener by selecting the Thread Group, right-click, select Add -> Listener -> Graph Results. Now we are ready to run the test. From the file menu bar, select Run ->Start. You will be prompted to save your test plan. You can save it or just hit “No”. You should see data points begin to be plotted on the Graph Result or whatever listener you selected. 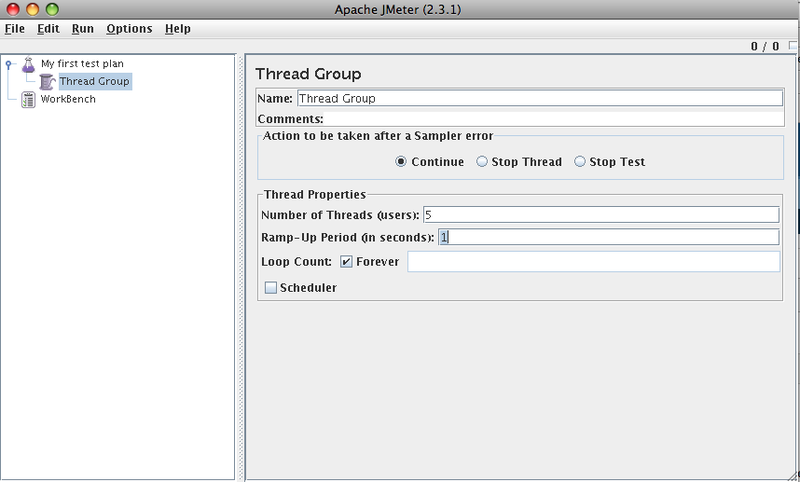 You can see the 5 threads we specified in the Thread Group taking up 5 apache processes. 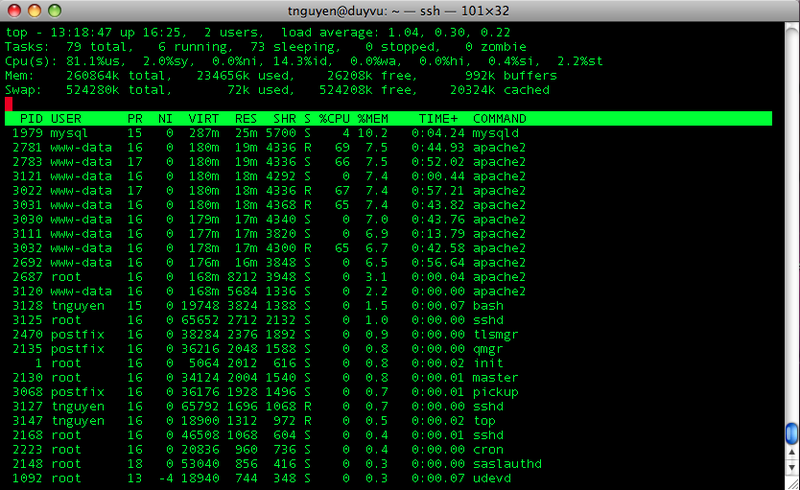 Overall, JMeter seems to be a great open source tool to test different kinds of load on servers. I look forward to trying it out at work. 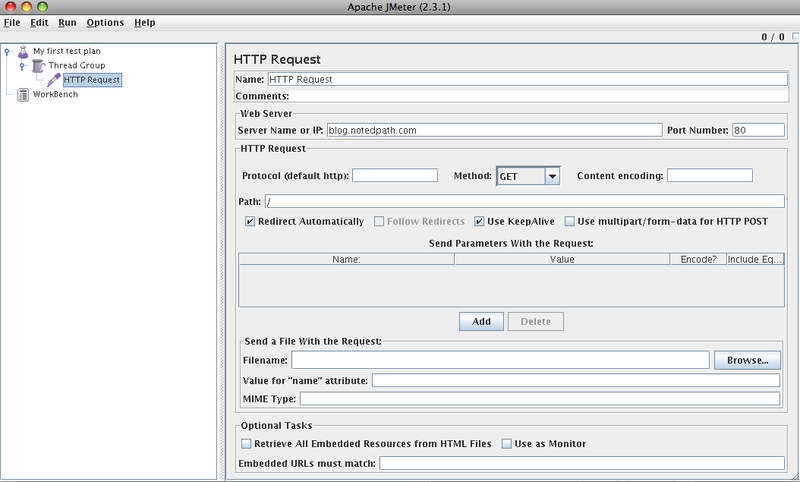 One last thing I came across is JMeter integration with your Ant build process. Check that out here. I would like to hear about other people’s experiences with JMeter, too. ← Prior work experience not needed? Yes, JMeter is great tool with lots of features. You might want to get more realistic numbers by clicking of “Retrieve all embedded…” on the HTTP sampler. Otherwise your are just downloading the HTML text file you have requested on the HTTP sampler. Jmeter is a great tool with lots of features, I used it for my web app test with login and other scenarios which gave xml response. JMeter is good for performance testing, but it has one big disadvantage: very simple out-of-box reporting tools. 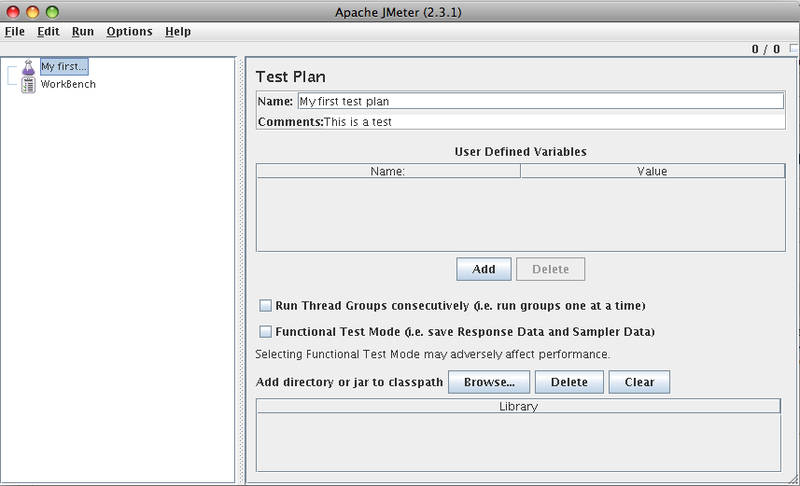 – use Jmeter plugin for cloud testing service.